Bit more of a fiddly stitch this one, with lots of counting. However, whilst it’s not strictly difficult, the harlequin stitch or starburst stitch is tricky because if you don’t get your tension right, it looks lopsided. The starburst motif is made up of two rows, so a bottom row of tr9tog – ie crochet together 9 treble (US: double) stitches and secure with a chain – and a top row of 9 trebles in that securing chain’s loop. 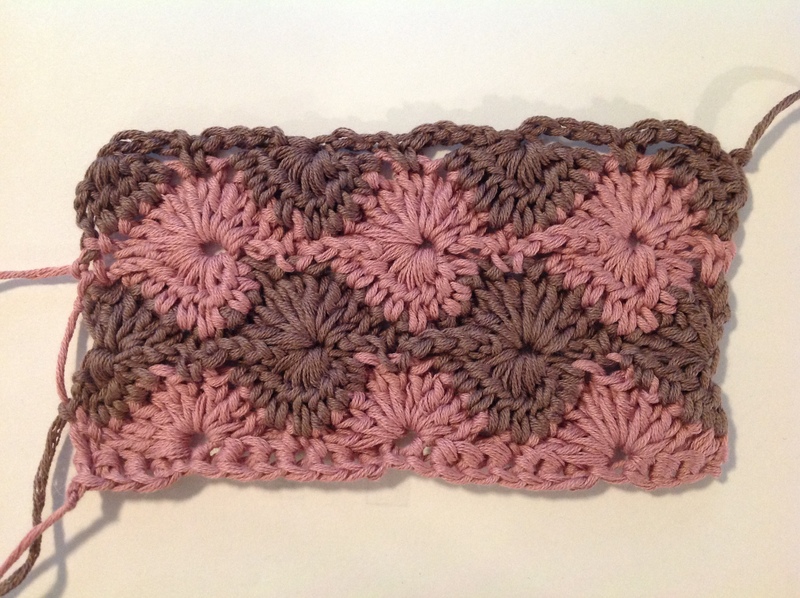 Ideally, you want the starburst motif to be symmetrical, but I repeatedly found that my tension on the righthand side – in the lower half of the motif formed by the first four or five trebles to be crocheted together – to be too tight, which gives you a slightly constricted look on that side. I suspect, also, that the tension on the top row of the brown below, ie treble 9 in one stitch, was also too loose, which makes the problem worse. It’s especially noticeable in the bottom half of the top lefthand pink starburst. I would hope that a little practice and a yarn with a bit more give might fix that problem, but still, this is a more challenging stitch if you’re a perfectionist looking for a nice symmetrical look.